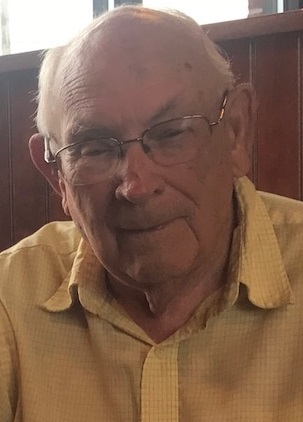 John Kenneth “Kenny” Adams, 92, passed away September 3, 2018 at St. Vincent Hospital in Evansville. He was born in Tobinsport, Indiana on August 11, 1926 to the late Frank E. and Zylpha (Weatherholt) Adams. Also preceding him in death was his wife, Bessie J. (Sprinkle) Adams; a son, John Adams; granddaughter, LaDonna Brooks; brother, Clifford Adams; and sisters, Jane Polk, Faye Weaver, Martha LaFollete and Mary Whitmore. Kenny was a graduate of Cannelton High School and was WWII Army veteran. He retired in 1990 from General Electric and later went to work as a janitor for the Tell City-Troy Township School Corporation. He was a member of Clayton Harris Methodist Church, Tobinsport and attended First Baptist Church, Cannelton. He was also a member of the American Legion Post #213 and Loyal Order of Moose 1424. Kenny enjoyed fishing, hunting horse racing, wood and metal work, planting a vegetable garden and spending time with his family. Surviving are his children, Mayor Jim Adams (Sharla), Tell City, Frank Adams (Sharon), Tell City, Brenda J. Adams, Kent, WA and Randall Adams (Sara), Madisonville, Kentucky; daughter in law, Martha Adams, Hawesville, Kentucky: brothers, Thomas F. Adams, Tell City and Paul L. Adams, Anderson, IN; seven grandchildren, seventeen great grandchildren and four great-great grandchildren. Funeral services will be held at 11:00 AM CST on Friday, September 7, 2018 at Huber Funeral Home, Tell City Chapel. Bro. Darren Gibbs and Rev. Jason Johns will officiate. Burial will follow in Simons Cemetery, Tobinsport with military rites. Visitation will be Thursday from 2:00-7:00 PM with a Moose Lodge service at 6:00PM and Friday from 9:00-11:00 AM at the funeral home. Memorial contributions may be made to Simons Cemetery or First Baptist Church, Cannelton Building Fund.